When I last commented on the recently released (outside of Japan) Dragon Quest VII 3DS remake on this blog, it was to share my impressions of the first seven or so hours of the game. Boy, you sure spend a lot of time running around in Dragon Quest VII, don't you?--Was the same true of Dragon Quest IX, my previous experience with this ages-old series? If so, I certainly don't remember it. Or at least I don't remember it impacting my enjoyment of that game as much as it is this one. Regardless, I've got to admit I've already become a bit annoyed by the game's many fetch quests that force you to return to locations you've already visited a number of times before. I know I'm "directionally challenged," but I think I'd regularly get lost in this game even if that weren't the case--Combine this piece of criticism with the last one and it should be clear that a Dragon Quest VII playthrough can really test your patience. Granted, some of this likely is my own fault. I can be more than a bit dense when it comes to keeping track of all the details that are thrown at me while playing an RPG. Although in my brain's defense, pretty much every locale here has two versions--one set in the past, and one set in the present--and as such I can't help but think most folks who decide to tackle this game also have a hard time keeping them straight, especially as the adventure progresses and the world opens up. What's the point of making monsters visible on the overworld (or in dungeons) if you can't escape them?--OK, so this actually isn't an issue while traversing Dragon Quest VII's overworld--or at least it's only rarely an issue in that context. It's very much an issue, though, once you dive into one of the game's many dungeons. Almost without exception, these dungeons are made up of claustrophobic hallways that make it nearly, if not completely, impossible to avoid oncoming baddies. In some cases, that means getting into a battle every couple of steps. Thankfully, the battles on offer here are snappy affairs, but that doesn't mean much when you're forced into 100 of them within a single, small dungeon. Is it just me, or does everyone here look the same?--Considering how much content developer Arte Piazza was able to squeeze into this diminutive 3DS cartridge, I can understand why they decided to cut a couple of corners along the way. Still, would it have killed that company's designers and programmers to have created a few more NPC models? It often seems like they made a small handful and then called it a day, as you encounter the same ones over and over and over again during your travels. That would bother me a lot less than it does, by the way, if it didn't regularly fool me into thinking I'm talking to a character I'd previously met when in fact it's just someone who looks like a character I'd previously met. 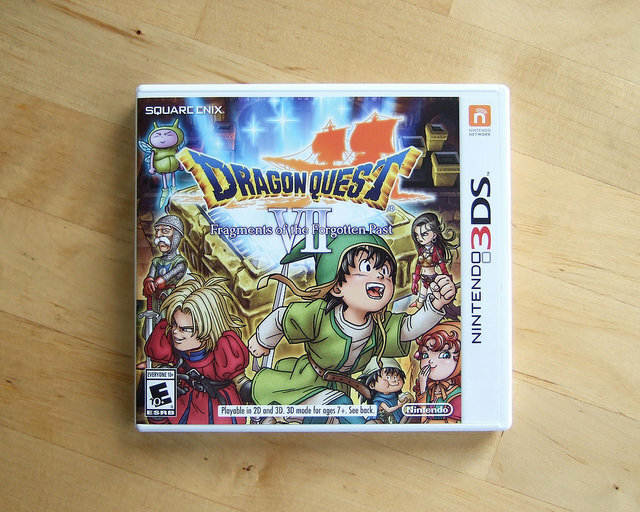 Given all of the above, you might think I'm no longer thrilled to be playing Dragon Quest VII. That couldn't be further from the truth. Yes, I'm mildly annoyed by some aspects of the game, but I'm loving the rest of it (especially the "party chat" option that's accessed with a push of the 3DS' B button), so don't expect me to walk away from it anytime soon. Now that I've said my piece, what do all of you who also are making your way through this 3DS remake think of it?